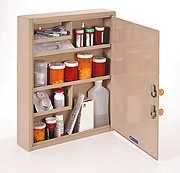 Cabinet has two locks keyed differently so contents cannot be removed unless two people are present to open the locks. Provides enhanced security for peace of mind. Sturdy welded-construction cabinet is made of durable heavy gauge steel and scratch & chip-resistant finish that stands up to everyday use. Two door-mounted disc tumbler locks hold door securely closed and deter break-ins. Each lock comes with two keys. Cabinet door features full length piano hinge for easy movement. Predrilled holes and mounting hardware (included) for easy wall mounting. Supplies not included. Color: Sand. Allow 5-7 working days for shipment. Select » 55-2019065D03-DS Size: 14" w. x 17 1/8" h. x 3 1/8" d.
Select » 55-2019035D03-DS Size: 8" w. x 12 1/8" h. x 2 5/8" d.